When I have a release to promote, the number one request I receive from bloggers is to share what true event, if any, inspired the book. Last month I shared that after a bout of bronchitis/sinus infection (which didn’t leave and got worse!) the praise was I revised the first novella I wrote after becoming a Christian. 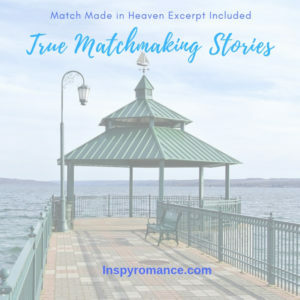 Match Made in Heaven is that novella, and it releases April 19. Although fiction, there are definitely some true experiences that I used in the book. Beth Prescott wants to make a difference with the senior citizens she serves as their volunteer coordinator, but the matchmaking efforts leave her guarded. She’s experienced too much pain to make that leap again. Dean Kellerman returns to the Finger Lakes area to help his grandfather and heal his own broken heart. He’s recommitted his life to Christ, and doesn’t want any distractions. When his grandfather needs assistance with a senior program, it places Dean right in Beth’s path. Can these two surrender their pasts to Christ and have faith in each other and their future? When I wrote this, I was single and a new Christian. I was definitely creating Dean with what I thought a Godly man would look like after walking away from the faith he grew up with. He was pure fiction because I had no point of reference. Beth was a different story. Like Beth, I worked at a senior center and placed them into not-for-profit volunteer assignments. I didn’t have grandparents growing up, so I was suddenly given probably 200 by the time I left the position. Once they heard I was single, the games began. There was always the talk of “You should meet my son/grandson/nephew/neighbor,” but there were a few bold enough to take those boys and drag them to me. In one instance, one young man sat in the corner of my dark office waiting for me. He was a new to the area thanks to a job with the Salvation Army and drove the bus. One of the volunteers I cared for was assigned to the Salvation Army and got to know this driver. She was a tough lady and next thing the driver knew, he was in my office waiting for me. What my volunteer didn’t tell him I was probably four years older than him. He had such a baby face. He didn’t want to be there. I didn’t want him there. But, he was new in town, so I offered to share places where young people would like to go. I was pretty sure the senior center wasn’t the place for him. The other instance that I didn’t use in the book but remember well was a colleague who worked in the adjacent office. She was a senior citizen who did not like that I was single. She had a boyfriend and felt I should as well. They had been out to dinner one night and met the chef. They thought he was perfect for me. Oh, how I hated the idea. They would NOT give up. So, off to a fancy restaurant in Watkins Glen I went. The picture you see in this post is very similar to the view I had that evening in Watkins Glen. Once I met my husband, we actually sailed there. I knew immediately this chef was not my heavenly match. I saw the mischief in his eyes and as he talked, I knew party was a big part of his lifestyle, and I no longer lived that way. I thanked my friends for thinking of me and figured they would never bother me again—that meal cost them $60 as I recall. There are so many things I love about God’s ways, and right up there was the way He matched my husband and me together. Once we met, the seniors were very protective of me. They asked his name, and Arduini is a known name in my hometown. Tom’s dad was a beloved musician, the “Dean Martin” of our city. They immediately embraced our relationship and all the matchmaking ceased. I’d love for you to get to know Dean and Beth better. Here’s a little excerpt. The automatic main entrance doors squealed as Beth Prescott failed to make a discreet arrival. With a groan, she searched for her office door key and click-clacked past the Hammondsport Senior Complex front desk. Beth balanced the folder as she maneuvered her purse and steadied the office key in her right hand. Her venti mocha still hadn’t kicked in with the energy level she needed to leave on time for Katy McGlen’s home visit. Although the senior citizen was as sweet as the caramel Beth added to her morning drink, Beth hated being behind schedule. Do you have any matchmaking stories? What an inspiration for a story. Some people just do love match making. It was frustrating at the time, but now I find it a sweet memory. Have a great weekend! Wemble, you are exactly right! The one that was waiting there in my dark office really startled me! Thanks for stopping by today! What fun stories, thank you for sharing! My pleasure, Paula Marie. I’m glad you enjoyed them. Have a great weekend! Hi Julie! Thanks for sharing. As a young woman, I was matchmaker for two of my girl friends at their request. In my home church several folks tried to match me up, which I resisted, because I wanted to go to college. I agree with Wemble that matchmaking attempts make for an intriguing and often humourous story line. Best wishes. Enjoy your weekend. Hi, Renate! Did you find success as a matchmaker? That sounds like a fun story right there! Thank you, Lori! I appreciate that. Back when I was married to my first husband, I worked down the hall from a really nice guy and he was very good looking. My sister was single and I thought they might make a nice couple but I never actually got around to matchmaking, although I did mention him to her. Fast forward a bit, my husband decided he didn’t want to be married anymore. It tore me up but we divorced. Circumstances worked out that the nice man down the hall became my boyfriend, then my husband (of 29 years as of this April 22nd). He got me through the aftermath of my divorce and has been there for me ever since. That’s my only matchmaker story. Sherri, I hate that you endured pain to find happiness, but I love how that worked out. That would be an amazing book! I worked in. Ursinf homes when I was very young. I didn’t have trouble with match makers u til I began working at a hospital! Then it was always a joke about getting a bed bath… I hated those! Thanks, Dalyn! I can just imagine the hospital banter. Thanks for stopping by! Priscila, I never thought of it as an American thing, but I think there’s truth to that. Matchmaking does make for great fiction, and some real happy endings, too. Have a great weekend! this is a very inspiring post. isnt it wonderful how God uses our lives to make them better? I agree! Thank you for reading. I’m glad you enjoyed the post! My family remained friends with one of our pastors after they moved to a new church. One summer when I was home from college, my mom and I went to visit them. They had invited a young man there (obviously to meet me). I found him very interesting, but alas, he thought I was too talkative. (True.) I met my husband many years later when my roommate introduced us. She was not matchmaking just being friendly to the new guys who had moved into our apartment complex. Your comment reminds me of this—God is the best matchmaker of them all! The most memorable time that someone tried to match me was when my boss thought he knew someone perfect for me because he had two cats (and I love cats). He brought him in to our office under the guise of giving him a tour so we could meet and he ended up looking like he could be my grandfather! There were definitely some decades between us! Ellie, That sounds like your story went in the opposite direction, age wise, to mine! Ha! I find the older I get I try to matchmake younger people all the time. I’ll take note of this post. :) Thank you for sharing. Thank you for the post Julie! My mom’s claim to fame is that she successfully set up my sister and her husband. His family was from the community, and his sister actually played softball with my sister. My mom worked through the mom network to get his contact info when my sister was in college. My sister emailed him, they went out and now they have been married 12.5 years! My mom also correctly predicted the city where my husband would be from. He lived 45 minutes away, we met on eHarmony. I think sometimes God puts things on our hearts or inklings in our mind. Go, Mom! This also would make such a fun story to read. Thank you for sharing, Mandy! I agree with you!